Led Bradshaw and his son Jake, left; one of Bradshaw's drawings of Jake Jetpulse, right. Led Bradshaw’s son Jake was 3 and a half years old when he was diagnosed with autism, the Brooklyn-based artist recalls. The answer lay in Bradshaw and Jake’s mutual love of comic book superheros. Bradshaw and Jake started drawing pictures together as an art therapy activity. The dad soon noticed his son liked to draw himself as a superhero, telling “intricate stories” about the character that took place in a universe he’d come up with. That’s when Bradshaw realized he could turn Jake’s drawings into something that could help him with school, he said. “I took some of the drawings he made and turned them into flashcards, and I would take his daily lessons and reading assignments and start turning them into… a visual way to help him learn,” Bradshaw recalled. What started out as flashcards evolved into Bradshaw’s first book — an “easy reader” for kindergarten and preschool-aged kids that centers around the adventures of “Jake Jetpulse,” the superhero his son created. Bradshaw and Jake first shared the comic book with Jake’s classmates, who “completely loved it,” he says. The artist has now published three educational books centered around the character, including two reading comprehension comics and an activity book. He plans to put out an educational “history adventure” next year, in which "Jake Jetpulse" and his crew will meet historical figures. Jake comes up with the characters and storylines, and Bradshaw brings them to life through his drawings, he said. For Bradshaw, who taught himself Adobe Photoshop and Illustrator because he didn’t have the money or time to go back to school, the comic books are the culmination of a life-long love of comics and cartoons. 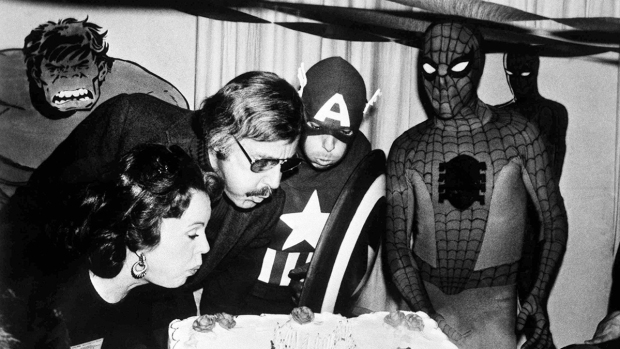 Bradshaw grew up watching cartoons about superheroes like The Incredible Hulk, Spider-Man and Batman (the Adam West show was a particular favorite) and received Stan Lee and John Buscema’s “How to Draw Comics the Marvel Way" as a birthday gift from his dad one year, he said. Lee’s passing on Monday was a “heartbreaker,” he said. After Bradshaw and Jake came up with “Jake Jetpulse,” Bradshaw started a website that showcases his books, provides resources for parents hoping to learn more about autism spectrum disorder and offers printable, superhero-centric educational worksheets for kids. Since he launched the site, he’s connected with a number of parents with kids on the autism spectrum, as well as advocates and educators. Jake is now in third grade at an elementary school in Bay Ridge, and his reading “has gotten a lot better,” Bradshaw says. And while the artist has been drawing for as long as he can remember, the “Jake Jetpulse” books wouldn’t exist without the real-life Jake, he said.